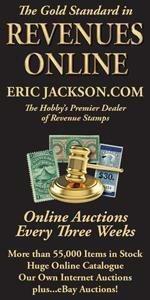 In my early years in professional philately, while progressing from the mail room of the Robert A. Siegel Auction Galleries to describer, auctioneer, and vice president, I can remember the great philatelists of that era coming to study and bid on the important United States 1851 One Cent Blue pieces. At the historic Newbury Auctions in the early 1960s, collectors such as Morrison Waud and Mort Neinken vied with great dealers like Ezra Cole and Raymond Weill. The competition was fierce, realizations at multiples of catalog were the rule, and the great pieces—just as they do today—went at prices that we all found hard to imagine. The enthusiasm those great philatelists displayed for the One Cent Blue was contagious, and as my career path took me to the presidency of the Sotheby Parke-Bernet Stamp Auction Company, I was privileged to offer the fabulous One Cent 1851-57 Collection of Ryohei Ishikawa. And yet, even as he sold the major portion of this outstanding study of the subject, Mr. Ishikawa retained a handful of pieces, including the 7R1E and 99R2 covers, for his outstanding U.S. Classic Grand Prix Exhibit. 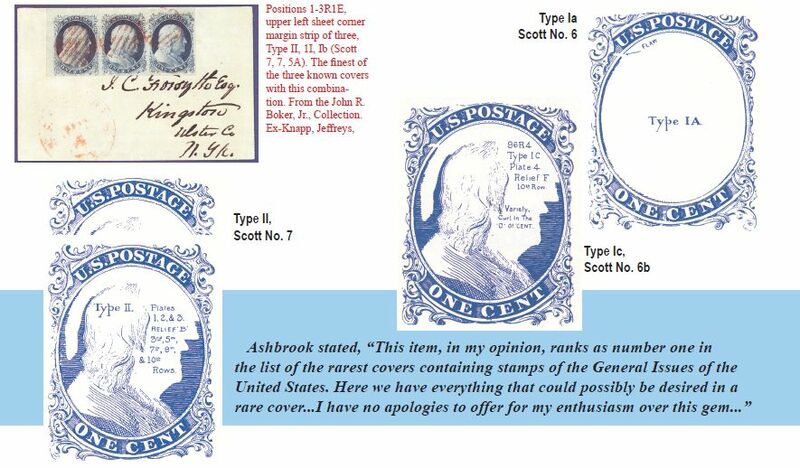 The 7R 1 E and 99R2 covers, which Ryohei Ishikawa regarded as the keystones to his collection, subsequently were acquired by John R. Boker, Jr. As my own philatelic career is so closely intertwined with the greatest examples of the United States 1851 One Cent Blue, it gives me great pleasure to present this Study of that issue and to illustrate these covers on behalf of the late Mr. Boker. Providing collectors with the romance and intrigue of an early Classic issue in all its varieties, the United States 1851 One Cent Blue has been, and continues to be, the centerpiece for some of the greatest and most valuable collections ever formed. Research and plating work on the One Cent Blue is most closely associated with Stanley B. Ashbrook. His landmark work, The United States One Cent Stamp of 1851-1857, was described by no less an authority than Lester G. Brookman as “the greatest philatelic study ever made.” The famous “Ashbrook Diagram” seen above illustrates and identifies all of the major characteristics of the 1851 One Cent Blue Issue. 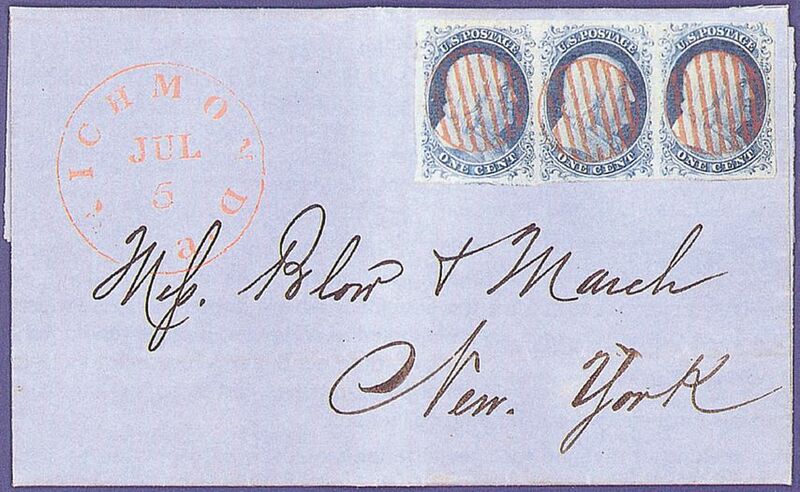 In his book, The United States One Cent Stamp of 1851 to 1861, Mortimer L. Neinken expanded on the plating work done by Ashbrook. Even though the One Cent Blue is one of the most widely collected and studied of all issues, the outstanding philatelists of our own time continue to research this issue for additional plate varieties and to pursue the One Cent Blue rarities as the basis for their own outstanding collections. A collector seeking an avenue for specialization would be hard pressed to select a better subject. The 1851 One Cent Blue encompasses all aspects of philately. Issued primarily to pay the required postage on unsealed printed circulars, it also found service by itself on drop letters (mail dropped off at a post office and picked up by the addressee at that some location), as payment for postage on newspapers, and as a carrier fee. In addition to its own distinct usages, it also can be collected in a myriad of combination usages with other issues. Nowhere is the wonderful collecting challenge offered by the One Cent Blue better manifested than in a study of its design varieties. Starting from one stunningly beautiful design that is a masterpiece of the engraver’s art, a total of five printing plates (counting the early and late stages of Plate 1 as separate plates), with 200 positions to each plate, produced a total of 1,000 positions for the imperforate One Cent stamp. In the remainder of this Study of the 1851 One Cent Blue Imperforate Issue, we will attempt to summarize the results of the plating work of Stanley B. Ashbrook and Mortimer Neinken, drawing upon the writings of those philatelists as well as the later work of Jerome S. Wagshal in his Philatelic Foundation Analysis Leaflet, The One Cent Stamp of 1851 and 1857. As noted, the printing plates used for all of the 1851 One Cent stamps consisted of 200 positions to a plate. The sheets of 200 stamps that came off the presses were cut into separate (left/right) panes of 100 each before being issued. For each pane of stamps, therefore, we have 100 positions, identified as 1 through 100, running from left to right and top to bottom so that the upper left stamp on a pane is position 1, the upper right stamp is position 10, and the lower right stamp is position 100. As might be expected, the complete design is classified as Type I. The only plate position on which this complete design is found is position 7R 1 E, the 7th stamp from the left across the top row of the right pane of plate 1 in its early state. This is the rarest and most valuable of the imperforate One Cent Blue stamps. It is seen in the cover on the top of the previous page as the left stamp in the strip of three. Its defining characteristics are shown in the middle illustration of the previous page. In the Type I design all of the ornaments are complete on all four sides. Further, the top and bottom lines also are complete. Of all the imperforate 1851 One Cent Blue stamps that were printed, the only examples that show the complete design as found on the original die are those few great rarities that come down to us today from this one position, Type I, position 7R1E, Scott #5. The Type Ib design is the next closest type to the complete Type I design. In fact, the plate position of Type Ib stamps also was in close proximity to the Type I stamp. The Type Ia design is the converse of Type Ib, showing full bottom ornaments and substantially reduced top ornaments. Just as the complete top designs (Type Ib) come only from a top row, the Type Ia stamps, with their complete bottom design, come only from 18 of the 20 positions on a bottom row, in this instance the bottom row of Plate 4. That plate came into use in early 1857, just before the introduction of perforations. It was used primarily in the production of perforated stamps; thus, imperforate Type Ia stamps rank second highest in value among all the One Cent Blue imperforate types (the only exception being one Type III position, to be discussed later in this study). In 1993, the Scott Specialized Catalogue editors added what One Cent specialists had recognized for decades, the Type Ic. The two best (and most valuable) Type Ic examples come from the two bottom row positions of Plate 4 that are not Type Ia (positions 91 and 96R4). They show the complete ornaments of Type Ia, except that the lower right plumes are partially erased. Approximately eight other examples of Type Ic come from two internal rows of Plate 4. They resemble Type IIIa stamps (on which the bottom ornaments are incomplete) except that the lower left plumes are complete, leaving the lower right plumes incomplete and therefore consistent with Type Ic characteristics. Brookman, in The United States Postage Stamps of the 19th Century, describes the distinguishing characteristics of this Type as follows: “...the top line is always complete, the top ornaments may be complete or they may be partially cut away, the bottom line is always complete, and the little balls of the bottom scrolls and the bottom of the lower plume ornaments are missing.” But there is much more to the Type II design, and Wagshal amplifies on Brookman: “...on most Type II positions the top ornaments are partially erased, but on a few Type II positions, specifically those from the top row of Plate 4...the top ornaments are complete. Specialists prize these positions above ordinary Type II positions. Also, Type II stamps from the rare Plate 3 often have an exceptionally deep, rich color, and a number of Plate 3 positions show fine crack lines. These, too, are more highly valued than the ordinary Type II stamps. Finally, although Plate 1 Late produced recut (Type IV) stamps from 199 of its 200 positions, one position—4R 1 L—was not recut: this is a Type II (altered from Type Ib in the early state of the Plate) which has a distinctive double transfer and is worth much more than an ordinary Type II.” To show the range that may exist within this type, in our Type II illustration, we herewith reproduce the design for those positions that show almost complete top omaments. Above that design we also present the top portion of Type II positions on which the top ornaments are more reduced. On this type, both the top and the bottom lines are broken. In addition, the top and bottom ornaments are always incomplete. Within this definition, because the line breaks at top and at bottom are the key distinguishing characteristics for Type III stamps, the degree to which both lines are broken is an important value determinant. The Scott Catalogue definition of Type III specifies that the breaks at top and bottom must be at least 2mm wide. Neinken classifies a stamp with a very small break at top and bottom as a “poor” example of Type III; a stamp with a wide break in the top line, “extending from a point directly under the ornament (point V on the Ashbrook diagram for Type I) to a point above the top of the ‘A’ of ‘POSTAGE’, but with the bottom line only slightly broken” as a fair example; and a stamp which shows a wide break for both lines as a “fine” example of Type III. “When Plate 1 was reworked from its early to its late state.. .almost all positions needed to be strengthened. Accordingly, 199 of the 200 positions on Plate 1 in its late state had some recutting at either top or bottom or both. Any recutting, in whatever degree, qualifies a stamp as Type IV. Since Plate 1 Late was used more than any other plate for imperforate One Cent production, Scott #9 is the most common imperforate One Cent stamp.